“When the Members are the Missionaries” – from the November 9, 2009 edition of St. John’s Parish Newsweek of St. John’s Episcopal Church, Clayton, CA. As you’ve probably heard me mention several times, in mid-October Susan and I spent five days at a workshop put on by an organization called Member Mission Network. 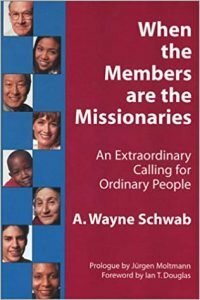 Member Mission is not a “new program” or a new way to “do church.” It is a profoundly Biblical way of looking at our daily lives. In this letter, I will spell out some of the core principles in language you’ll be hearing in the future. 1) God is at work—on mission—in the world. God’s mission is a mission of love and justice. God’s mission was fully expressed in the life and teachings of Jesus. Jesus summed up God’s mission by calling us to love God and neighbor—to make the world a more loving and just place. 2) God’s mission has a church. The church exists not to build and maintain itself or its power, but to participate in God’s mission of making the world a more just and loving place. We far too often make the mistake of defining God’s mission by the way our church is structured, rather than thinking about how we can structure our life to better allow us to do God’s work. 3) We join God’s mission in our baptism. In baptism, God adopts us God’s children and empowers us through the Holy Spirit to carry out the mission of love and justice in the world. 4) God is as concerned about how we live Monday through Saturday as about how we do on Sunday. In our daily lives, we have a greater opportunity to make the world more just and loving than we do in church on Sunday morning. (This is not to say that our worship and our congregational mission are unimportant. It is to say that individuals can do many things which congregations cannot.) If you’re unconvinced, think about what we were reminded of yesterday by Paul Henshaw—that our members are helping make the world more just and loving by being active in almost 70 organizations outside St. John’s church! This coming Sunday, we celebrate the great Christian Feast of All Saints. We are blessed to have two baptisms at our 10:00 a.m. service, and we’ll renew our Baptismal Covenant at both services. As we do so, I invite you to consider how these vows express the principles outlined above. Saints—past, present and yet to come—are people called to fulfill—with God’s help—God’s mission in their daily lives.